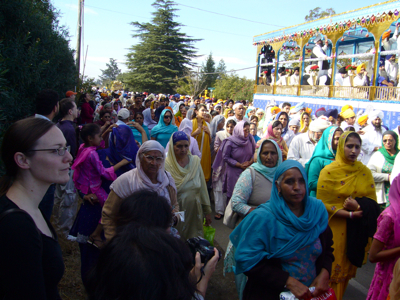 Food is offered free to all who come: Every single one of the 60,000 Sikh (give or take 20,000 in any given year) who take part in the festival, and the few hundred curious folk like me who show up for the food. 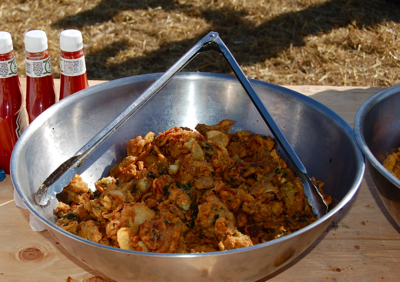 Cauliflower pakoras fresh from the oil. 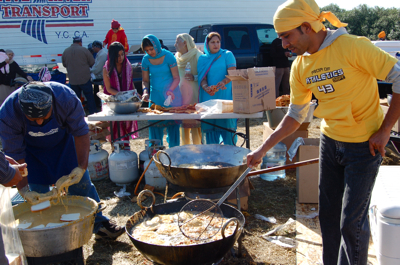 All along the side of the parade’s path are stations of Sikh men and women rolling roti, frying pakoras, stirring curries, and cutting sweets. Everything served is vegetarian, to be as inclusive as possible. Friendly, young men offer fresh fruit, water, juice, and hot chai to all who walk by â€“ even the Christian evangelists with their placards and flyers. A line of women roll fill bread with potatoes masala while a two-man team shares dipping and frying duty. 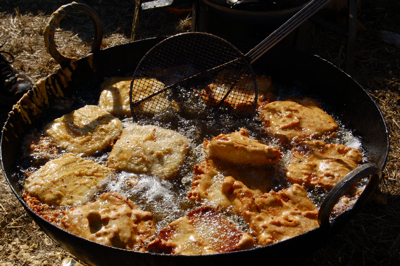 Men from the Punjab region of Northern India were among the earliest immigrants to the Pacific Northwest and then the Central and Imperial Valleys of California. Many of them were Sikh, and their hard work â€“ felling trees, laying rails, and laboring in fields and orchards â€“ helped build the West. 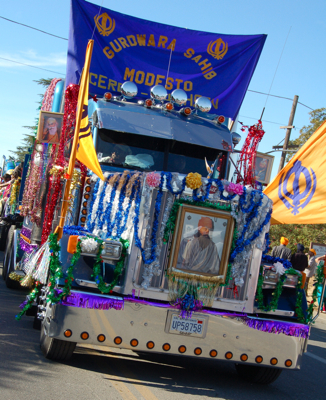 The November festival in Yuba City honors the Sikh scriptures, the Guru Granth Sahib, and the recitation of its words is central to the procession. Large, decorated semi-trucks help pull the priests and musicians through the crowded streets. This Thursday, I’ll be giving a presentation about the importance of the communal kitchen in the Sikh religion. There’ll be lots more photos, including many archival ones, and we’ll discuss how Asian Americans such as the Sikh navigated strict immigration and alien land laws to establish thriving farms in the Central Valley. The Indian karahi has the same lovely, generous shape as a Chinese wok.